Whether in a residential or commercial property, a clog in the drain is likely to occur sooner or later. Those who have experienced a clogged drain know how inconvenient it is to perform daily tasks, such as washing their hands or preparing a meal, amidst dirty water. If the drains in your home or business frequently develops clogs, consider these common causes for blocked drains to help avoid clogs in your plumbing system. If a clog is preventing water from draining properly on your property, contact Sunshine Plumbing and Gas. Even a minor clog can develop into a plumbing disaster, including slow water drainage, pipe corrosion, flooding, and even sewage backup. Our plumbing repair company provides all-encompassing services that work to optimize your plumbing system. Each of our plumbers is expertly trained to remove even the most stubborn clogs and get your drain working properly again before you know it. We also provide 24-hour emergency service, so you never have to handle a plumbing disaster alone. What Items Can Clog The Sink Drain? Clogged drains and blocked pipes may seem to be minor issues, but they can quickly escalate to bigger issues. Clogs can occur for a number of different reasons, but the following includes four of the most common causes of clogged pipes and drains in residential and commercial properties. Food is one of the most prevalent causes of clogged kitchen drains. Even if you’re mindful of keeping food out of the sink, small particles or grains of rice, bread, and other foods can be easy to miss while cooking or washing the dishes. Garbage disposals are a helpful tool, but they cannot dissolve anything and everything that people put into them. Even with a garbage disposal, food washed down the drain can accumulate in the pipe system and under the sink, especially if food particles are regularly thrown down the sink. In general, Ocala plumbers recommend homeowners let as little food as possible into the drain. Scrape away large particles and throw them in the trash. Pay special attention to avoid washing down egg shells, coffee grounds, raw meat with bones, pasta, potato peels, fruit pits, artichokes, celery and produce stickers. Though primarily found in shower and tub drains, hair clogs can happen in any drain. Fallen pieces of hair can easily get stuck inside pipes, especially if the hair is long and/or falls off in big chunks. Residue that coats each strand of hair — from shampoo, soap, hair products, and natural scalp oils — can congeal and attach the hair stick to the inner pipe's lining. Over time, accumulated hair particles create a solid mass within the pipe and trap any food or grease particles that venture down the drain. One or two strands of hair won’t cause the plumbing to fail but it’s important that you prevent hair from accumulating over time. Keep hair out of the drain by purchasing and installing sink guards or drain protectors, which collect the majority of hair outside of the drain. Another major cause of sink clogs occurs when oils and other fat-based substances are poured down the drain. While grease may appear to be liquid enough to easily go through the pipes, but grease can congeal and stick to the walls of the piping system. What’s more, solidified grease can accumulate over time, collect other food particles, and affect other pipes and plumbing components. Avoid pouring oils down the drain altogether. After cooking, contain hot grease in a heat-proof container. Once the grease solidifies, empty the hardened contents into the trash. Because disposals cannot dissolve liquid grease, be sure to turn on the garbage disposal while running cold water to help the grease pass through the pipes. Should the pipe remain clogged, contact us to schedule sink drain repair. We will ensure the drain clog-free and drains properly. Miscellaneous tiny objects can fall into any drain in a home and cause and/or aggravate clogs. Supervise children while they use the sink to prevent them from dropping small toys in the drain. Other items you should avoid flushing or washing down includes paper towels; cat litter; rags; feminine hygiene products; cotton balls; dental floss; wet wipes; nail polish; polish remover; paints; medications; antifreeze; and other toxic or flammable chemicals. Each of these items can also cause and exacerbate clogs in the plumbing system. On its own, a tiny object may not cause an apparent clog. But it just takes one small object to act as a base layer for other particles to attach to and accumulate within. In addition to preventing hair clogs, sink guards and drain protectors prevent clogs from small objects. If a clog is minor enough, you may be able to fish out the clog on your own with a plumbing snake, a pliable metal clothes hanger, or a piece of wire bent into a hook. To avoid dangerous accidents, always exercise caution when attempting to clear a clog and never use your fingers. More complex drain clogs are best left cleared by the professionals. If water drains significantly slower than in the past, or if the water won’t drain at all, it’s likely that you have a clog that requires an expert’s attention. Other signs of a clogged drain include water flowing from the drain back into the sink and bad odors or lingering smells coming from the drain. If you suspect your drain is clogged or there is a plumbing problem, call Sunshine Plumbing and Gas. We will arrive promptly and remove the clog before it is able to become worse or affect other important components in the plumbing system. 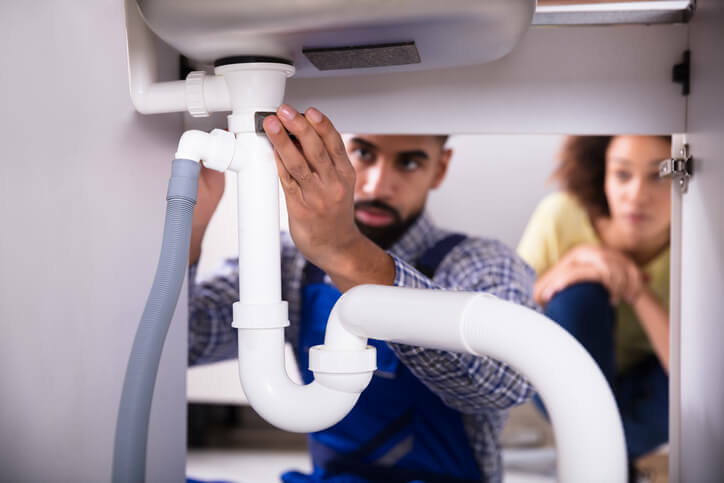 We provide a full range of commercial plumbing and residential plumbing services in Gainesville and Ocala, FL, that work to optimize the function and longevity of your plumbing system. If you have a clog, don’t wait — contact us today.